I was looking for some pictures on my old blog a couple weeks ago and ran across this post. It seems especially appropriate because I half think our current house is haunted and last night was particularly noisy. The previous occupant was a 97-year-old man who passed away (while on vacation and not in the house). His name was Maitland and it's gotten to the point where any time there are weird noises or doors randomly slamming I yell in my best no-nonsense mom voice, "Knock it off, Maitland!" Weirdly, that seems to work. At least he's an obedient ghost. Lately I've been thinking about all the places I've lived and the surprising lack of paranormal experiences (I was the type of kid who read too much RL Stein before bed and then let my imagination run away with me. I should have scared myself into seeing a ghost at some point. Or aliens. Because I loved me some X-Files). The house with greatest haunted potential would be the one I grew up in in California. It was by far the oldest of any I've lived in (unfortunately I don't even remember what decade it was built, but I'm pretty sure it was at least 60 years old). It was creaky and all, but devoid of any invisible extra occupants (that I was aware of). The house my parents live in now is not particularly old and has been completely remodeled. Nothing scary there. The house in-between the two, though? Had potential. 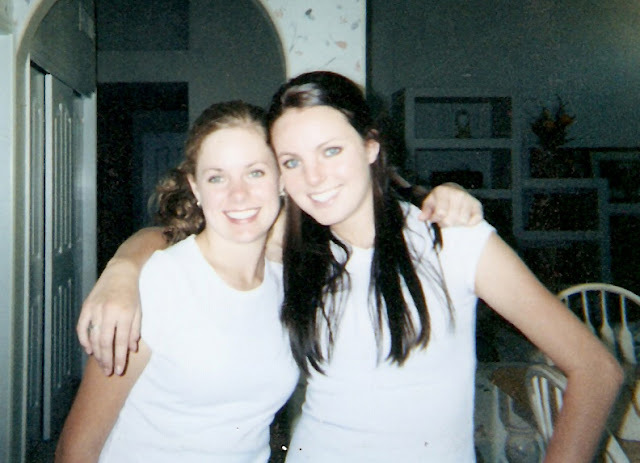 Nikki and I in high school in the haunted-ish house. We moved to Arizona when I was 14. I had moved on from Goosebumps at that point, but I still read a lot of ghost stories and loved scary movies. I didn't really believe in ghosts or hauntings but it was fun to be a little scared sometimes. The house was built in the early 1980s. Not a prime haunting decade, but let's run with it. I had a really great bedroom with a high ceiling. One of the quirky things about my room was that directly over the door there was a sizable ledge and on the wall over this ledge there was another smaller door that went to the attic. We had lived in the house for less than a week when I noticed that the door was slightly ajar. It had been completely closed every other time I'd looked up there. I was staring at it, wondering if maybe my dad had opened it or something when, abruptly, it slammed closed. My heart skipped a beat and I skidded out of that room and ran straight for the kitchen where other living people were hanging out. Sweet merciful frick, we had a ghost. I knew there had to be some logical explanation but I couldn't think of one. A ghost was sharing my room with me! And randomly opening and slamming the attic access door! I wasn't sure how I would sleep at night. It happened a couple more times over the next few days and it even started to become almost routine. I started nervously talking to the ghost from time to time. Like, "Hi, I'm Kayla. I'm really sorry I'm in your room but I have no where else to sleep and I'mnotafraidofyouanywaysothere!" And then I'd hide under my covers, positive that if I peeped my head out I would see something very unpleasant at the foot of my bed. One afternoon, about a week after the first door incident, I was home alone doing my hair in the bathroom I shared with my sister. I could see the toilet from where I was standing and it was vacant. And then I heard the seat lift. And then I heard someone peeing. I stared at the toilet. There was no one there. The peeing continued. I froze. OMG, I thought, we have a ghost that PEES! Heart pounding, I tore out of the bathroom, hellbent on getting out of the house. I turned the corner and ran smack into my little brother, just home from his friend's house. As it turned out, our bathroom and the hall bathroom shared a skylight. We had just discovered in the most heart-attack-inducing way possible that if you stood in one bathroom you could hear all the intimate details of what was going on in the other via the skylight shafts connecting at the roofline. As for the door in my room, I finally figured out that it opened and closed every time the A/C kicked on. Something to do with the pressure changes, I imagine. I did stop talking to my ghost but the door still held a kind of low-level terror for me during the four years I slept in that room. I refused to look at it at night, just in case there was something looking back. Funny and yet still spooky, even WITH the explanation!